The Pattern Modeling Suite (3D Advanced) is a tool bar add-on for Project Designer that enables modeling of 3D relief patterns. Extrude, sweep, and puff shapes into dimensional creations. These tools are easy-to-use and makes your own custom pattern design fun and simple. The puffing tools allow closed vector shapes to be raised up or puffed in four different styles; Curve, bevel, flat and bubble. The steepness of the sides and depth of puffs can be adjusted to suit. The Sweep tools will allow a drawn profile to be swept along a single vector path. This means the profile will follow the line along it’s entire length. There are two types of sweeps, rounded, which will round corners, and corner, which leaves sharp corners. 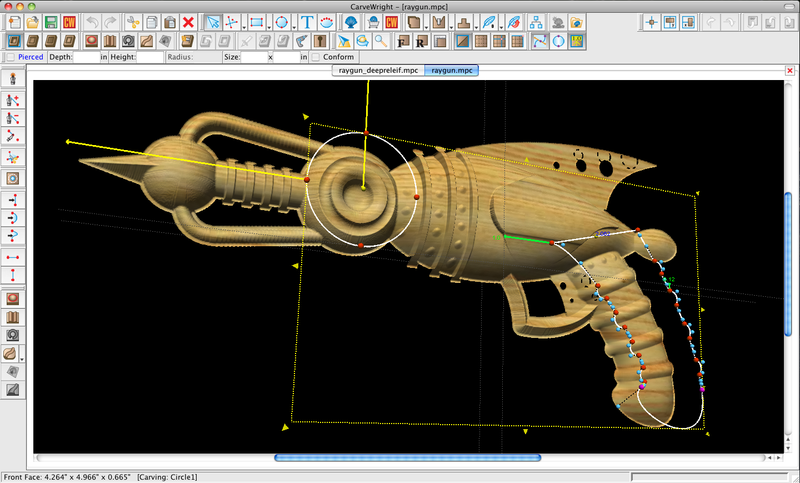 The Extrude tool allows a profile to be extruded along the inside of a closed vector shape. The angle of the extrusion can be adjusted by setting horizontal, vertical, or setting a custom angle. The Revolve tool will rotate a profile around the center-point of a circle. The revolve tool only works with circles. The Tilt tool allows a pattern to be tilted vertically, horizontally, or a combination of both can be used to achieve different angles. The Sweep with Rails tool is a more dynamic sweep in that it uses two curves (rails). These two curves define the two edges of the surface. Then a profile is defined for the surface’s cross sections. This video demonstrates the use of the several tools included in the 2D Vector Suite and 3D Pattern Modeling Suite in modeling a pattern from an imported tracing photograph. Both software suites are available as add-on’s to the Basic CarveWright software that comes with the purchase of every CarveWright CNC System. This video explores how the Vector Drawing Suite and 3D Pattern Modeling Suite work together to model patterns. This tutorial demonstrates the Sweep, Revolve, and Puffing tools from the 3D suite and the Smart Spline, Offset Path, and Copy Offset tools from the Vector suite. One of the Pattern Modeling (3D Advanced) tools is the the powerful sweep with rails. This video is an overview of how the tools works.